Whether or not you always need a helmet for longboarding is an ongoing, often heated debate. If you bring up the topic among skaters, almost everyone will have a clear opinion and be vocal about it, at times even aggressively. That wearing a helmet reduces the risk of injury by protecting your skull is common sense. So what’s this really about? Why are longboarders constantly arguing about whether to use a helmet or not? 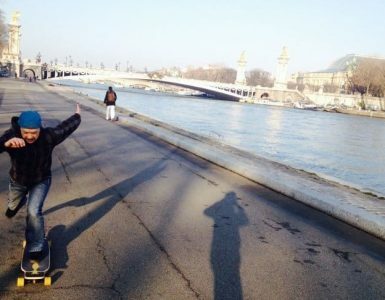 Most longboarders will agree that a helmet is required for disciplines such as downhill racing and skatepark riding which involve substantial risks of injury. Where people start to disagree is when it comes to pushing on flats at low speeds, say under 10 or 15 mph. The argument being that for an experienced skater, this type of riding is not riskier as jogging. In this post, I thought I’d dig a little deeper and find out what longboarders are really saying, what they’re actually doing with regards to wearing a helmet, and why! Which helmet should you wear? I slapped together a short 10-question survey and posted it on a couple of longboarding groups. Within an hour I already had 20 responses, which shows this is a topic that matters to riders! As the time of this writing, the survey has 80 responses. In case you want to see the actual data (charts and anonymous individual responses) you can see the results here. By the way, you can still take the survey if you want to, I’ll update this post if I get a bunch of new responses. So let’s look briefly at what longboarders are saying. But first, who are these riders? 3/4 of the respondents ride at least several times a week. Most of them consider themselves intermediate to advanced riders, some of them even riding at a competitive level, most of them with many years of longboarding experience. A few respondents are expert racers or long distance skaters. About 1/3 are in the 25-34 age group, followed by 35-44 (20%) and 18-24 (20%). The riders are predominantly male (92%). When asked about their helmet habits when riding in general, close to half of the longboarders say they always wear a helmet, while about 20% say they usually do. A little under 20% rarely or never wear one. When it comes to cruising and commuting, however, the proportion of riders who always wear a helmet drops to 40%, while those who never or rarely do climb to 30% of the sample. Based on the comments, it appears many riders don’t use a helmet for local cruising on flat ground and for short distances, while they do wear one near traffic and on longer distance rides. Riding with kids motivates riders to wear a helmet though. Only 63% of the longboarders who took the survey actually freeride or downhill. Of those who do, 90% always wear a helmet. Freeriders may be gutsy, but I guess they’re not crazy! Respondents comment that not wearing a helmet for this type of riding would be “stupid”, “no exception” should be allowed, particularly when “pushing your limits”. Besides helmet, riders use fulls pads, gloves and crash pants. Of those surveyed, only 53% do freestyle. 57% of them always wear a helmet, while 12% usually do. Based on the comments, freestylers mostly wear a helmet when riding at a park (ramps and bowls), not as much for street skating. When it comes to longboard dancing, 28% of the respondents practice that style. More than 1/3 always wear a helmet, and 22% usually do. Slightly more than 20% never wear a bucket when dancing. Nearly 3/4 of the longboarders surveyed don’t think people wearing a helmet (including themselves) look stupid, while the rest think they do a little. Some riders’ perception changed after they started wearing a helmet themselves and became more safety conscious. Some say riders NOT wearing a helmet, and riders who get badly injured because of it, look more stupid. A couple of respondents (younger riders) don’t mind helmets which are low profile, well decorated, or not too big for the style being done. Others (older riders) don’t care about the way they look. This question was not very well formulated and so was a bit confusing for the respondents. From the comments however, it appears most riders felt the helmet was the single most important item to be wearing. Next to helmet are slide gloves/wrist guards and knee pads, elbow pads come last. A couple of riders also mentioned proper deck and setup as being an important safety factor as well. 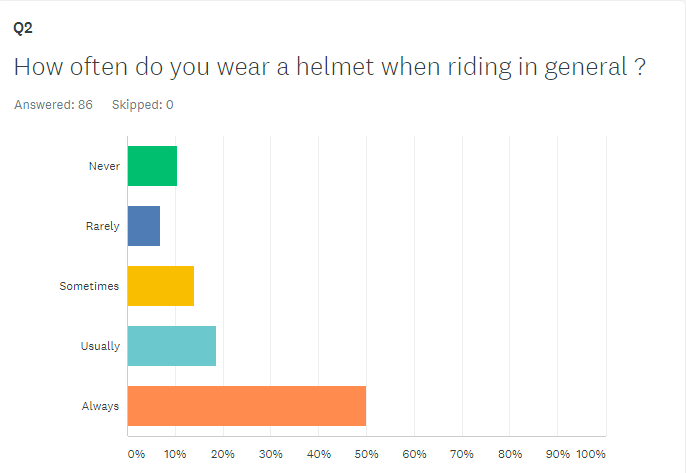 Based on the results of this quick survey with 80 responses, about half of the riders wear their helmet all the time. When it comes to flatland cruising and commuting, that percentage drops since many feel these are low risk activities. On the other hand, freeride and downhill riders typically wear a helmet consistently. Freestylers mostly wear a helmet at the skatepark but not for street skating. About a fifth of the longboard dancers never wear a helmet. The majority of longboarders don’t have a negative perception of riders who wear helmets, seeing it as a smart choice despite some discomfort. Most of the people surveyed feel a helmet is the most important safety item to have. Let’s look at some of the main reasons people argue for and against wearing a helmet. But first, a quick reminder: falling on your head without protection can lead to head concussions, traumatic brain injuries and intra-skull bleeding. There are thousands of examples of longboarders ending up in the hospital following a bad fall, getting crippled (loss mental ability, sense of smell, etc), or being paralyzed e.g. after hitting the back of their head on the sidewalk. Now of course, this isn’t really about the pros and cons of wearing a helmet in general. Pretty much everyone agrees that a helmet is required at least for some riding activities (see the survey above). The question here is, should you wear a helmet all the time? And so the real question is, is a helmet really necessary for an intermediate to advanced longboarder cruising at slow speeds on flat ground? Pushing and cruising at speed under 15 mph is very much like running, there’s very little risk of falling (unless you’re a beginner, in which case you should be wearing a helmet anyway). It’s about as risky as tripping over a crack while running – you don’t wear a helmet for jogging. If anything, when cruising at really low speed you just need to know how to fall and have good reflexes. An experienced longboarder will not fall backward (the biggest risk of head injury) because he/she will keep forward momentum and will never let the board slip out from under him/her when going slow. Helmets are uncomfortable and make you sweaty around the head. It hinders your riding experience and keeps you from feeling the wind in your hair. Carrying your helmet everywhere is a hassle. Wearing a helmet is a personal choice, and you shouldn’t be harassed by others for not wearing one if you don’t want to. You only really need a helmet when freeriding, downhilling, or bowl riding, the rest is optional. Many riders have had serious head concussion leading to the emergency room while riding on flat ground, even though they had two or more years of longboarding experience. One possible cause of accident is improper board setup, which can result in wheelbite and stop the board in its tracks, causing the rider to fall on his/her head. Cruising can be risky because you typically ride in a relaxed position with your guard down, leaning heavily and often without bending your knees. Even when riding on a flat surface you know well, your wheels may hit some debris or deep crack, making you slip off your board, fall backward and slam your head on the road or sidewalk (true story). Falling on your head once makes you realize how important wearing your helmet is. Just because you’re going slow doesn’t mean it’s safer – riders commonly get not only head concussions but also broken wrists, dislocated thumbs, cracked ribs, and sprained knees. Check out this reddit thread for an example! A car may pull out on you while you’re riding very slow on flat. In some states, you can get a ticket for longboarding without a helmet. When dancing on your longboard at slow speed on flat, you may miss a weight transfer and hit the ground with your head very quickly. Some helmets have anti-sweating, anti-smell/anti-bacterian properties. Some have more ventilation than others, which makes a difference in terms of comfort. Some are better constructed with the hard foam inside lining solidly attached to the exterior hard shell. This post is primarily about whether or not to wear a helmet when riding at slow speed (cruising, commuting, dancing, even street skating), so I’ll focus on half-shell helmets and leave aside full-face downhill helmets. Triple 8 Gotham: turn dial at the back gives a good fit. Stink free liner. Scarce ventilation, good for winter. Bell Segment: flexible outer shell, some riders like that, others don’t. Solid and affordable though. 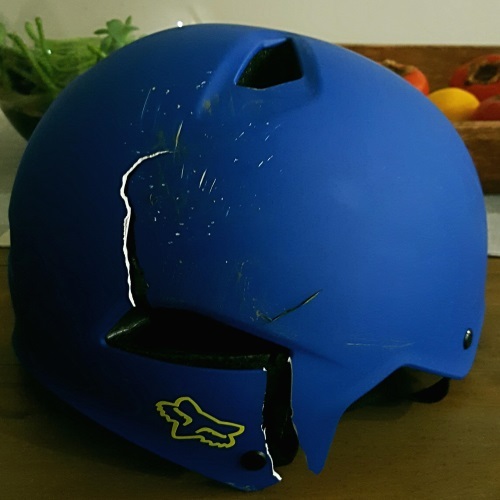 Key final tip: if you hit the ground really hard with your helmet, you should get a new one, even if the shell is not damaged and the foam is not ccracked/deformed There may be cracks invisible to the eye, don’t risk it. In this post, I’ve tried to make some sense out of the endless debate about the need for wearing a helmet when longboarding. As it turns out, most experienced longboarders agree on the necessity to wear one for freeriding and downhill (which I think is common sense), distance pushing, and skatepark shredding. With regards to slow cruising or taking a quick trip down the street to the store, however, the debate rages on. Personally, after seeing or hearing about all those improbable accidents involving head injuries, I’ve started wearing one at all times. Even for slow/short range cruises or pumping around the sidewalks on my longboard. Better safe than sorry / crippled / dead. But hey, that’s just me. Everyone is free to choose. I may be getting a new helmet though, one more lightweight and with improved fit, comfort and ventilation. Anf then, like the owner of the helmet on the featured image of this article does, I may use it like a canvas for self-expression and feel good about it.